when it comes to calendars! On the personal side - you can give us picures of your family and we will create a beautiful calendar for your home or to give as gifts. Sharing your family photos is always a great gift idea for relatives who are far away - let us help you with that! As a corporate gift, a calendar makes an impression every single day of the year. 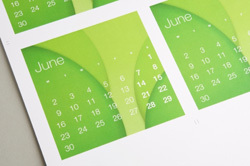 Make it a good one with professional striking calendars by one of our designers. Or, if you have a print ready file, we can put full color technologies and quality printing processes to work for you, ensuring your project comes out vibrant and sharp. You can use these as a marketing and promotional piece to get your company name and products in the public eye. Where else can you guarantee that a customer will be looking at your marketing piece for a whole year? Customers also love it when you give them something for free!